Last weekend I was in Nashville, Tennessee at a weight loss seminar. I did laugh when my Chiropractic Internist group picked this subject for a seminar content because at conferences we all tend to over eat, me included. The speakers were very good and had fresh ideas that I want to share with you over the next couple of weekends. I was at CVS yesterday picking up a prescription for my 89 year old Father and I noticed that there must have been 800 prescriptions in bins to be picked up. I think all pharmacists should wear carpal tunnel braces after watching 3 prescriptions being filled every minute. As a society this is not a good thing to be needing this many prescriptions and a fair amount of the need is from being overweight. Obesity related illnesses cost the U.S. economy 480 billion dollars in 2016. 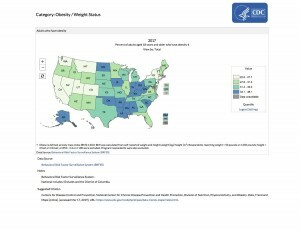 I found an interesting Obesity Charts from the Center for Disease Control showing how Obesity has changed significantly over the last 30 years. https://nccd.cdc.gov/dnpao_dtm/rdPage.aspx?rdReport=DNPAO_DTM.ExploreByTopic&islClass=OWS&islTopic=OWS1&go=GO. I went home and had to face my own reality. I got out the tape measure and measured my waist against my height. Guys, the measurement is not at your waist line but above it where we are the roundest. Yes, I tried cheating and my wife put an end to that measurement. Fellas, do not do this in front of your wives. For men and women the largest part of your abdomen is supposed to be less than half your height. I did not do so good. Over the next few weekends I will be sharing the information I learned with you and we can do this together. Now that there is more sunlight and the temperature is warming up we can start to get outdoors and increase our activity along with some other ideas. 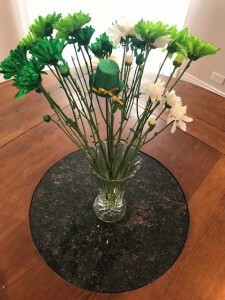 Today I have a son who was born on St. Patrick’s Day and well I am Irish so we are celebrating. Thank you to Betty for coming by with the St. Patrick’s Day Flowers.